We have a date for the JCPenney Grand Opening Day in Manhattan Mall! I'm pretty ecstatic to hear July 31st is scheduled to be Penney's big opening day. Woo hoo! 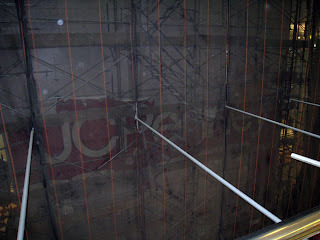 And look closely below: a peek at an enormous JCPenney sign in the middle of the mall. Excited yet? You know I am. To celebrate I'm browsing the I 'Heart' Ronson on sale now at JCPenney online. (Dear JCP: Please bring discounted Ronson to Manhattan Mall, thanks). You can see the old Strawberry makeshift store on 1. The sign-in-progress peeking through. 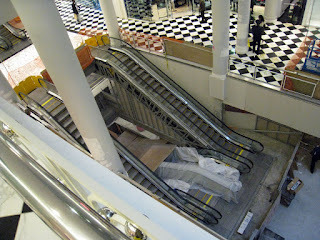 Shiny, pretty new second floor, and the escalators down to LL1 & LL2, JCP's new home. Dresses and romper are $19.99. Romper ($26.99), cardi ($12.99), and maxi ($42.99). 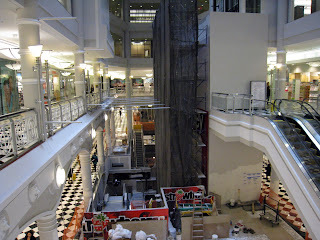 JCPenney Manhattan Mall, Lower Levels 1 & 2, opening July 31st. wooooo! i'm excited... will have to go mid august because i don't need to crash and have road rage with newly opened malls..
That romper is os cute! I wish they will open a store here too! Sounds it's going to be so cool!!!! Hope you're having a great weekend dear!! 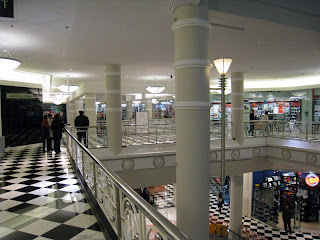 I really want to see that I <3 Ronson line in person, but our JcPenny closed down years ago to be replaced by a Macys. =/ I'll have to settle for seeing it online!